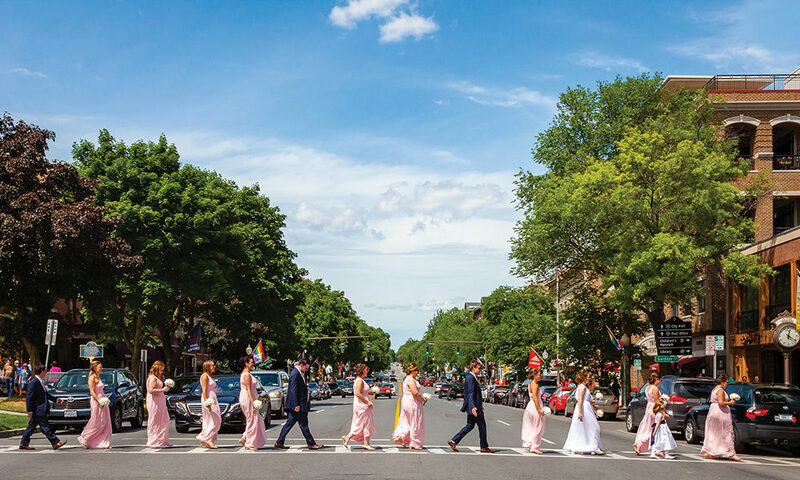 A stroll through Saratoga Springs' beautiful Downtown—with a Beatles twist!—made this couple's wedding day especially memorable. These days, weddings are as much about the photos as they are the ceremony. OK, OK. Maybe that’s not entirely true, but I know for sure that on my wedding day, my dark blue-clad bridesmaids and I will be taking photos at my family friends’ blueberry farm before anyone says “I do.” Saratogians Jeremiah and Timothy Tyrrell know what I’m talking about; their Saratoga-tastic wedding whisked them from their aunt and uncle’s condo at the High Rock, to Saratoga National Golf Club, to the dance floors of Caroline Street, but not without a stop for a good, old-fashioned photoshoot on Broadway. Though they reside here now, Timothy and Jeremiah got married in Saratoga while they were living abroad in Zurich. “We always found ourselves visiting Saratoga, whether it was for dinner or even a weekend vacation,” Jeremiah says. “And now we live Downtown with many reminders of our wedding day that are always bringing us back to the best day of our lives,” Jeremiah says. And as if crossing Broadway wasn’t enough of a daily reminder of their big day, Timothy and Jeremiah will always have their gorgeous wedding photos, too.